Create a personalized greeting by mounting photos, artwork, or pictures to the front of these beautifully embossed, acid-free Photo Mount Cards. 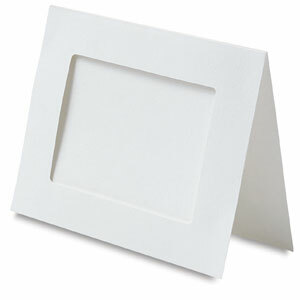 For a variation in style, use the trifold Photo Frame Cards to easily mat pictures in the cutout window. The window accommodates either a 3½" × 5" (89 mm × 127 mm) photo or a 4" × 6" (102 mm × 152 mm) photo in the 3¼" × 4¾" centered opening. Matching envelopes measure 5¼" × 7¼" (133 mm × 184 mm).